From the Biblical plagues of Egypt to a major infestation in Madacasgar two years ago, locust swarms have caused chaos throughout history. Just one swarm can cover 20% of the land surface of the Earth, affecting the livelihood of 10% of the world’s population by consuming up to 200 tons of vegetation per day. Understanding how swarms form and what can break them apart, then, is of great importance. Our study, published in Physical Review E, used mathematical modeling to tackle the problem. We managed to show that a locust in a swarm must be able to interact with at least two neighbors simultaneously. Without those two neighbors, the insects can’t reproduce the striking spontaneous changes in direction we are used to seeing in flocks of starlings, schools of fish – and swarms of locusts. The finding adds to our previous observation of how locust swarms can be so stable. By watching locusts move around a ring, we identified some interesting behavior. Small numbers of locusts move around the ring at random, but larger groups start to march together in the same direction. These groups will then spontaneously switch to march in the other direction. The more locusts in a group the longer the time interval between switches and the more stable the swarm. We were able to reproduce this behavior in a mathematical model – and discovered that locusts move more randomly when they don’t have near neighbors. So, forming a swarm is all about neighbors – but that doesn’t make it “neighborly”. The reason locusts pay so much attention to their neighbors is because locusts are cannibals. The best way for swarming insects to get the protein and salt they need is to eat each other. And that’s bad news for any locust that isn’t watching what its neighbors are up to. Consequently, when in a group, any locust that is out of line with its neighbors will expose its vulnerable flank and face a greater chance of being cannibalized. By being in line, they will be safer – but will also help hold the swarm together. The huge size of swarms, however, make this method impractical, too. 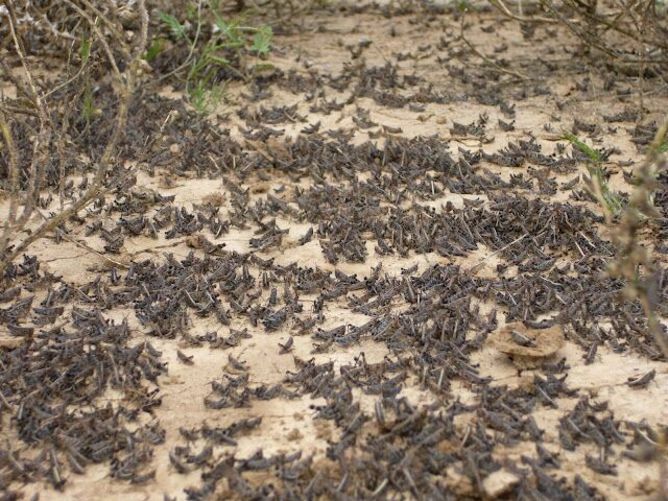 A typical locust swarm can cover several hundred square kilometers. Locusts can fly up to two kilometers in the air and have even been reported to travel over whole oceans. It can comprise tens of millions of locusts, each eating their own weight in food every day. However, we hope that by conducting further research we might find better ways to break up swarms using similar methods. In the past, management strategies have typically focused on creating exclusion zones – by burning tires to create an exclusion zone, catching them in nets or digging trenches. At best, these local measures will prevent locusts from reaching a particular area, but can do little to halt the progress of the swarm.